Microsoft has published a release preview guide for the next major cloud update to its Business Applications. In this post, we've highlighted the main themes and new features that caught our eye across Dynamics 365 Customer Engagement apps. Microsoft recently changed the way it manages cloud updates which requires all users to be on the same version. As a result, there will no longer be an option to skip a major update. This next update is scheduled to roll out between October 2018 and March 2019, once released, admins will need to schedule this. Any sites still using v8.2 must plan to be on the latest version by 31 January 2019 for all Customer Engagement apps. In v9, Microsoft rolled out a new Unified Interface which uses responsive design to provide a uniform experience across any screen size, device, form or browser. For most users, the new UI is hidden as there were several important gaps in comparison with regular web UI. As a result, relatively few sites have enabled the new experience, instead using a refreshed version of the legacy interface. For the October 2018 update, admins will be able to choose between enabling the new Unified experience, or retaining the legacy classic web UI. To determine which user experience is best for your organisation in this upcoming release, we recommend taking early action gain familiarity with the UI. Using native functionality, data can be more accurately captured with option sets that are contextual to previous field entries without the need to involve custom code. This is just one example of new functionality that will be exclusive to the Unified Interface. By enabling administrators to apply greater customization, processes can be made more interactive. In v9 with Sales Navigator connected, LinkedIn widgets can be added that provide added insights about contacts and companies within the Dynamics interface but these offer limited scope for customisation. By using the new customizable controls for process flows it will now be possible to embed LinkedIn insights within process flows. Within the initial stage of a lead, this could promote LinkedIn data to highlight conversation starters that would support connection requests. At each stage, it will be possible to configure controls that show LinkedIn insights about individual contacts and companies. This includes Teamlink that leverages your organisation's LinkedIn network to identify colleague who may be able to make an introduction. New SharePoint integration for web portals will enable document libraries to be shared with users within the Portal UI with controls to manage uploads and file deletion permissions. Further controls will enable Power BI visualizations to be embedded within portal pages. Personalized views of dashboards and reports will be presentable via the portal UI - even if portal users don't have a Power BI account. Initially available in a public preview, the October release will introduce new integration with Teams. This will make it possible for a D365 record to be pinned to an associated Team and be accessible to all members within the Teams UI, even if members aren't Dynamics users. Using the 'Set Regarding' control in the App for Outlook will be made easier by filtering the entities that appear. As a result, this will avoid users having to scroll through a long list of irrelevant entity types. The October 2018 preview guide references a slew of new Artificial Intelligence capabilities that will introduce more prescriptive and proactive insights. The Universal Resource Scheduler used in Field & Project Service apps will now offer additional flexibility to assign work orders to resource groups. New 'Crew' scheduling means that people and other resources can be grouped together for a specific period of time. This is designed to fit scenarios where a team remain together in carrying out a series of jobs during a day. Also, the URS will now be available in the Customer Service app to replace the legacy service scheduling functionality. Through continuing investments in the Power platform, these capabilities combine across Power BI, PowerApps and Microsoft Flow underpinned by the Common Data Service for Apps. 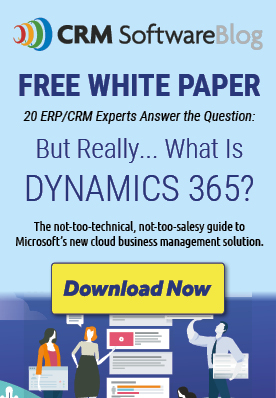 This provides an unrivaled array of tools to extend, customize and integrate Dynamics 365 apps and Office 365 into your environment. In the October 2018 update, Flow, PowerApps and CDS will be unified in the same interface to help administrators more easily trade app activity and usage. A new solution checker will help to identify PowerApps performance issues and highlight any API's that are due to be deprecated. Canvas apps support connections to more than 200 data sources including cloud services. App designers will now be able to bring these capabilities directly into model-driven D365 entity forms in the same way that custom controls are added with support for look-ups and option sets. A new set-up process will help new users quickly get started with Microsoft Social Engagement. Microsoft say this will include a guided experience to define search topics. Historical data will then be acquired and immediately loaded. Preact is a Microsoft Gold Partner implementing and supporting CRM solutions since 1993.